You would think that after the New Year celebration and The Three Kings the next occasion will be only Easter? No, if you live in Malaga or plan to visit Malaga in February you are wrong! At the beginning of the second month of the year, Malaga is celebrating the annual event called El Carnaval De Malaga. Carnaval of Malaga or el carnaval de Malaga is annual celebration taking place in Malaga, Region of Andalucia in February. As all other carnavals of Spain, it is a very old celebration documented since the Middle Age. If you would ask the Andalusian person which carnaval is the most important in the region they would probably say that the one of Cadiz. However, the carnaval of Malaga attracts more and more attention and it is bigger and bigger every year. This year carnaval of Malaga will receive even more groups, participants, and visitors than in the previous years. around 70 groups from all Andalusia such as Cadiz, Cordoba, Granada, Almeria, registered their participation. This year 6 groups of singers, musicians, and dancers taking part in the carnaval also called comparsas will present their shows. This is a huge achievement of Malaga which never happened before. Carnaval of Malaga is not that type of the carnaval which stays in the theatres. All main streets, squares, historical part of the city and mall during the week of the carnaval is filled with music and different colors. The festival starts with all groups such as cantos, murgas, comparsas, cuertetos y coros meeting at the Cervantes Theatre (El Teatro Cervantes) for the competition. The final of the competition is normally taking place day before the inauguration of the carnaval. Inauguration of the festival is taking place in the main square of the city called La Plaza de la Constitucion. After the official ceremony, God Momo and the Goddess of Carnaval are chosen. The carnaval is full of events during the entire week. 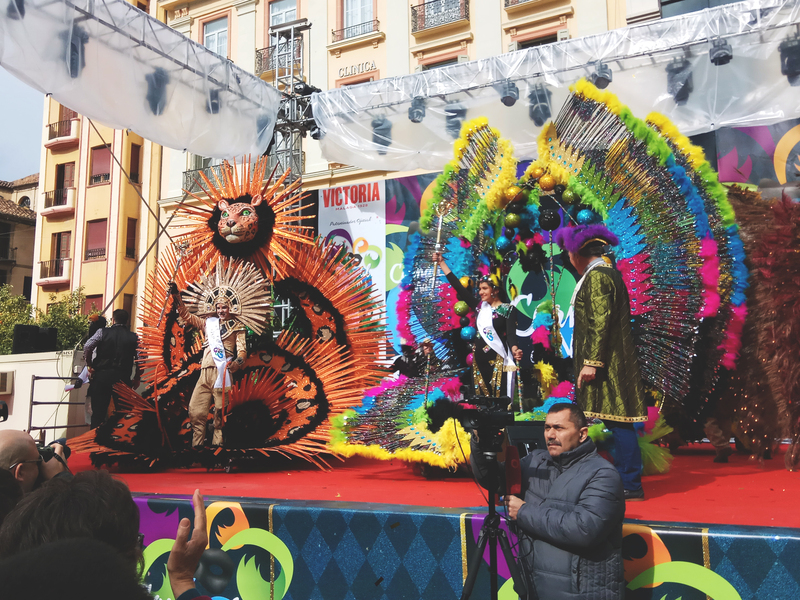 Big carnaval parade through streets of the centre of the city, street performances, concert reissuing the final of the competition, battles and much other contest are just a few events of the carnaval which attract thousands of people to Malaga every year. The carnaval of Malaga is always traditionally finished with the burial of the anchovy called Boqueron at the beach of the Malagueta. The burial procession crosses the streets of the centre and heads towards the beach to perform the ritual and to witness the fireworks show. More information about the carnaval you can always find on the official website of the celebration in Spanish. Ready to laugh and be impressed? Don’t miss the opportunity to see Malaga and Spanish culture in a unique way!